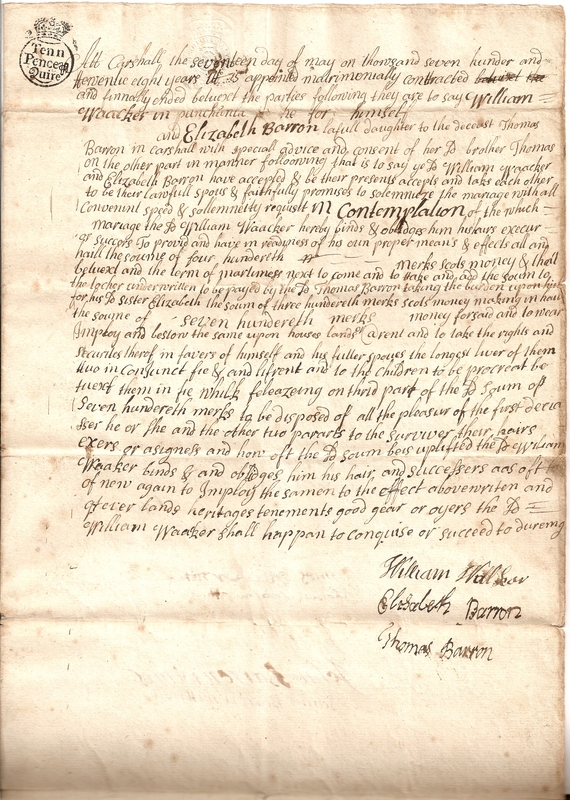 This is the first in a series of posts about old papers of the WALKER family, from Kirkliston, West Lothian, Scotland. I will compile a list of these papers HERE. In January 2014 (just after I began this blog), I came home from a family gathering with an old wooden box from my aunt, stuffed full of old WALKER family papers. Many of these papers date from the 1800’s and early 1900’s. 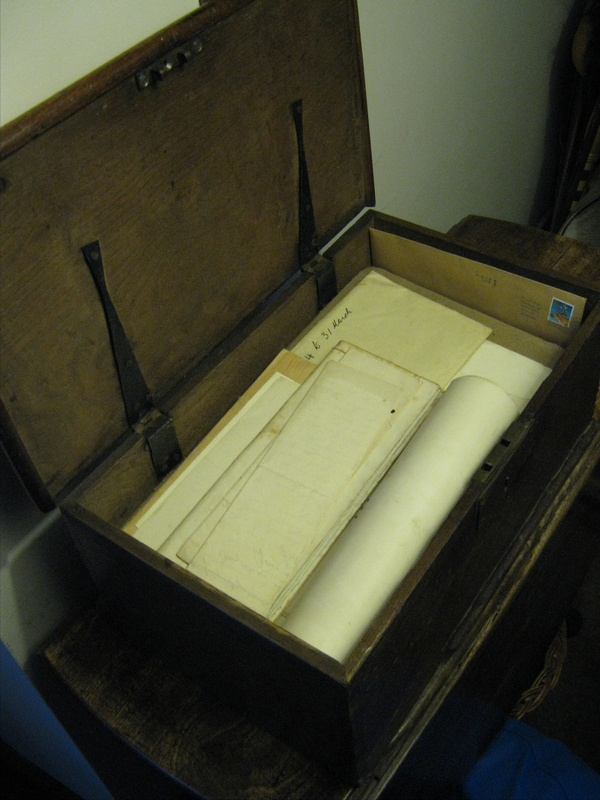 But I’m going to start by posting the contents of one particular envelope – labeled “Old Wills etc. of the Walker family”. The contents of this envelope all date from the 1700’s, and I’m going to start with the oldest document of them all – probably the oldest of any document that I’ve yet handled. It’s a marriage contract is dated “17th May 1728”. Please click on the images to see the scans at full resolution. Transcribed text appears in a Maroon colour below each scanned image. Then there are some notes of my own at the end. to the surviver their hairs exer or asaigness. Waacker – the writer of the text clearly mis-spells the Walker surname repeatedly. It is “Walker” because that’s how William Walker signs himself on both pages. wright; probably a carpenter, a worker of wood – Wikipedia. I believe that “Carshall” (named at the beginning of the document) lay N.W. of Gogar Mains, on the south side of Gogar Burn – about where the carpark of Edinburgh airport now sits!). Old maps from the National Library of Scotland use several different spellings, including; Kersshall, Kershall, Claywalls, & Clay Was. Parish registers of the time record Thomas Barron as a “tenant in Clay-walls”. Likewise “Punchunla” appears on these old maps with several different spellings – the most regular (I believe) being “Punchinlaw” or “Puncheonlaw”. It lay on the south side of the road which runs N.E. out of Kirkliston towards Cramond and Dalmeny. It appears to have been part of the Carlowrie estate. “Douphington” (which I believe is Dolphington) and Craigie lay further up the same road as Puncheonlaw. On the maps they appear due north of Carshall/Kershall. West Craiges (or West Craigs) lays East of Gogar, towards Corstorphine village. “Corstorphin rige” (or Corstorphine Rigg”) lay north of East Craigs, and west of Clermiston. Portsbrugh; probably Portsburgh – the area of central Edinburgh, south of the castle – Wikipedia. 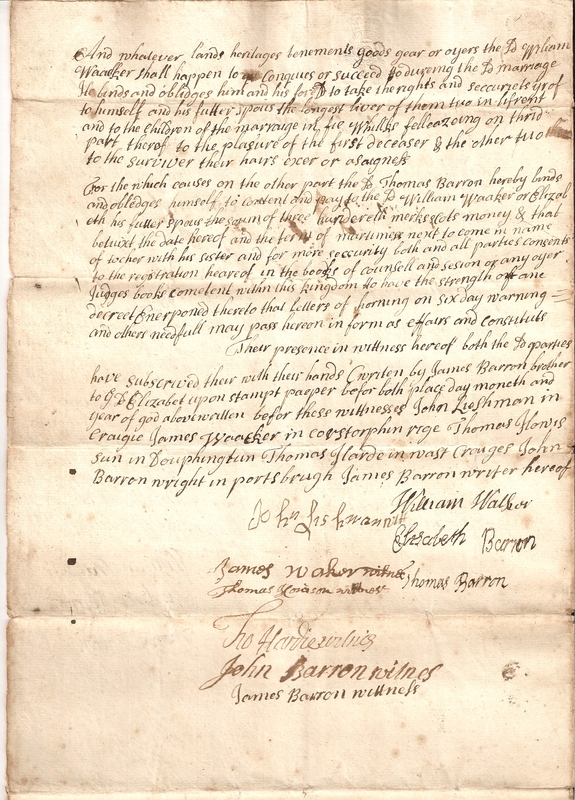 Thomas, James, & John Barron are Elizabeth Barron’s brothers. I’ve not found out anything else about James or John! But from Corstorphine parish registers (which I’ve viewed on microfilm, and from IGI transcriptions) I have details of Thomas Barron, “tenant in Claywalls”, marring Anne Bartholomew (or Bartleman) on 17th February 1727, and having 5 children christened between 1729 and 1744. James Walker in Corstorphine – I don’t know where he fits in! He is presumably a relative of William Walker – most likely a brother! I am aware of a well recorded Walker family living in the Corstorphine area, dating back to the early 1600’s (I obtained details from a visit to the Corstorphine Heritage Centre in 2008). (Also see HERE). I suspect there is a link here somewhere! I have just found a transcribed record HERE of James Walker in Corstorphine Rigg, married to Isabel Dowie, with a son, John, chr.19/12/1730. A number of other records of these names appear to show their marriage in Cramond in Nov. 1729, and a number of children christened in several different parishes. John Lieshman in Craigie – I don’t know if he’s a relative. 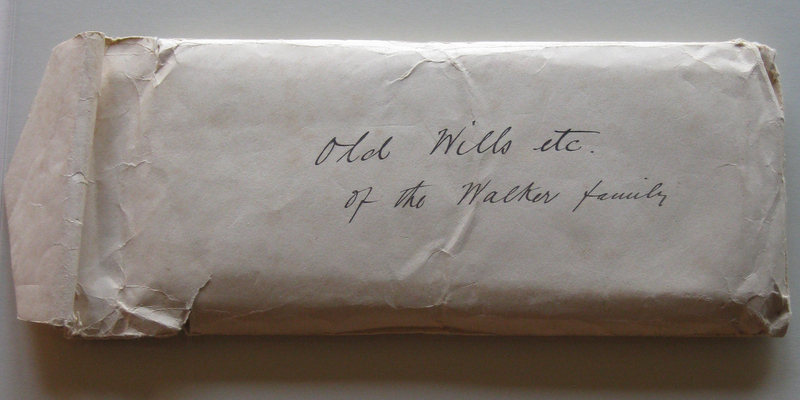 The envelope labeled “Old Wills etc. of the Walker family” also contains the Disposition of John Lishman, and the “Discharges” by his heirs in response (which I will post to the site later). William Walker appears to have been John Lishman’s executor. The surname “Leshman” appears in a family tree of “Walkers in Corstorphine”, so John Lieshman might be a cousin of William Walker! Thomas Harde in West Craiges – When I googled “Baron family Gogar” I found this publication in Google Books. Originally published in 1890, “Some Old Families”, by Hardy Bertram McCall contains a chapter on the Hardie family (p.51), including Thomas Hardie “tenant of West Craigs” (who is a witness in the document, above). Thomas Hardie grew up at Gogar Mains, and his mother was a “Janet Baron” (shown in a Baron family tree in Some Old Families, p.53). So although its not shown in McCall’s tree, it looks highly likely to me that Thomas Hardie would be a cousin of Elizabeth Barron. 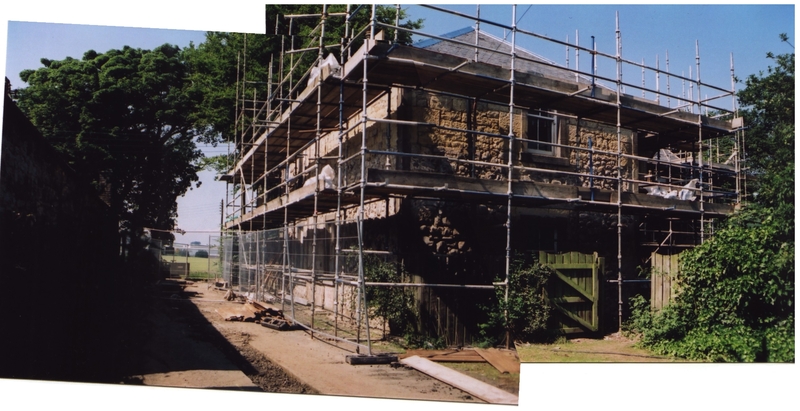 Thomas Honison in Dolphington – I have no other details about him! The surname may be mis-spelt! 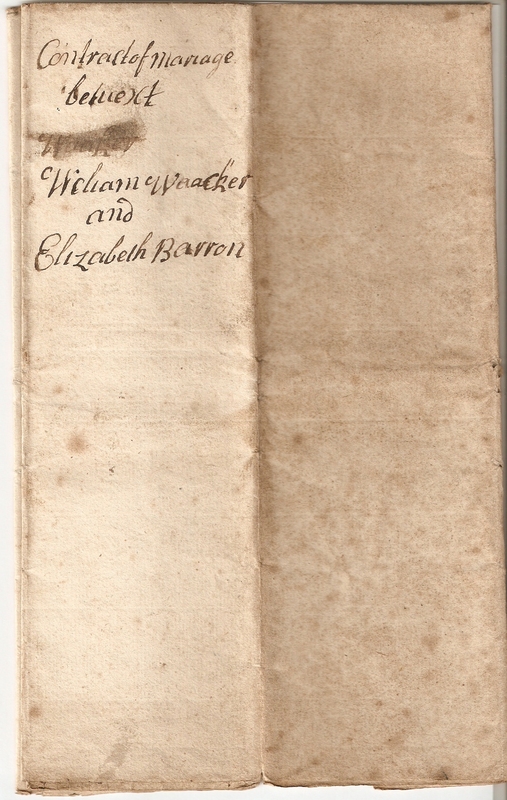 I would be really interested in any other information that anyone may have about the people mentioned above, particularly if it can prove (or disprove) any family relationships to William Walker and Elizabeth Barron. Please leave a comment below, or use the Contact Page to get in touch. Currently William Walker is my earliest known ancestor in the direct male line (my 5x Great-Grandfather – see HERE ), and I’d love to have more evidence for my assumption that Elizabeth is related to the Baron family recorded by Hardy Bertram McCall in “Some Old Families”.